U.S. AIR FORCE ACADEMY, Colo. — U.S. Air Force Academy Cadet 1st Class Kyle Haak was recently selected as both the Air Force Association Cadet of the Year and U.S. Air Force Cadet of the Year for 2018. The USAF Cadet OTY award is open to USAFA, Reserve Officer Training Corps and Officer Training School cadets while the AFA award is specific to USAFA cadets. Haak is currently pursuing a major in Physics with a minor in Nuclear Weapons and Strategy and is presently the number one ranked cadet out of 1,018 in overall academic performance. He has made the Dean’s Ace list every semester and has been selected to the Class of 2019 cohort of cadets being considered for the Rhodes, Marshall, Gates-Cambridge and Schwartzman scholarship process. Aside from excelling in the classroom, Haak is also a star on the ice rink. As an Air Force Hockey player, he is a two-time Academic All-American, having earned third-team honors last season. This past season, he served as a team captain and helped lead the team to one of its best seasons in school history, something he hopes he and his fellow seniors can improve upon this year. 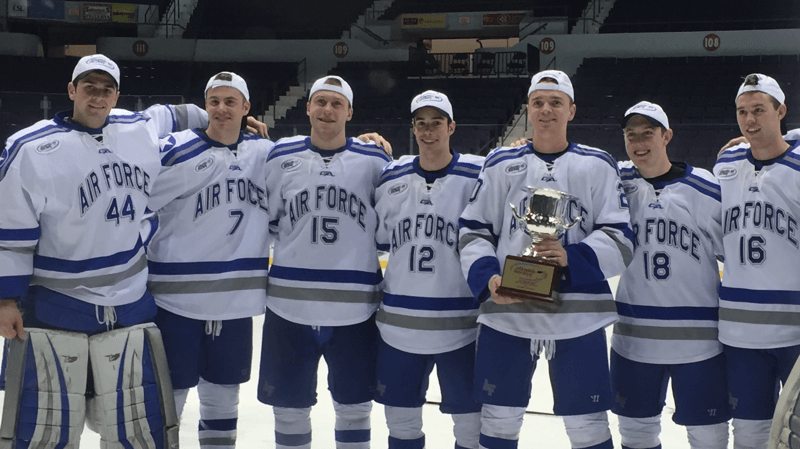 “I’m looking forward to the 2018-2019 Air Force Academy Hockey season that will be led by the seven seniors who can take this team to the greatest heights in program history,” he said. After graduating next summer, Haak plans to continue on to pilot training where he hopes to become an Air Force fighter pilot.